In recent years, public and critical appreciation of The Smiths has been at its height, yet the most important British band after The Beatles have rarely been subject to sustained academic scrutiny. Why pamper life’s complexities? remedies this by bringing together diverse research disciplines to place the band in a series of enlightening social, cultural and political contexts. The book discusses a range of very timely issues, from Thatcherism, Catholicism, class and sexuality to suicide, fandom, the city of Manchester, cultural iconography and the cult of Morrissey. 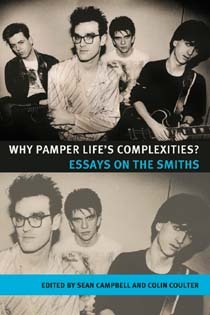 The essays breach the boundaries of music history, rock biography and pop culture studies to give a groundbreaking critical analysis of the band. Why pamper life’s complexities? will be launched on 26th November at Waterstones Deansgate. The event will provide fans with a unique opportunity to take part in a panel discussion chaired by Dave Haslam, legendary Manchester DJ (Haçienda) and author of Manchester, England (Sunday Times’ Pop Music Book of the Year). The panel discussion will be followed by a drinks reception and book signing. Tickets for the launch cost £3, and can be purchased online at www.wegottickets.com, or on the door. More details can be found on the Manchester University Press homepage (www.manchesteruniversitypress.co.uk), or by contacting Bethan Hirst on 0161 275 2310. Category: Film & Media, Music, Sociology, Uncategorized	0 Comments.